ICET Officials will invite the online applications from the eligible students for appearing at the Integrated Common Entrance Test (ICET-2019) for admission into M.B.A. and M.C.A. courses (full time/part-time/evening/distance mode) offered by the following Universities in the State of Andhra Pradesh including their affiliated colleges for the academic year 2019-2020.
a) The candidates should be Indian Nationals and should satisfy local/non-local status requirements laid down in the Andhra Pradesh Educational Institutions (Regulations of Admission) Order, 1974 as amended up to date (as per G.O. Ms.No. 25, dated: 19.03.2004 & G.O.Ms.No.108, dated 3-7-2005,Higher Education Department, dated 30-7-2005 and its amendments). i) For MBA: Should have passed recognized Bachelors Degree Examination of minimum three years duration with at least 50% marks (45% marks in case of reserved categories) in the qualifying examination. ii) For MCA: Should have passed recognized Bachelors Degree examination of minimum three years duration with at least 50% marks (45% marks in case of reserved categories) in the qualifying examination with Mathematics at 10+2 level. d) The qualifying Degree obtained by Distance Mode Program should have recognition by joint committee of UGC, AICTE and DEC.
f) Admission into any college depends on its Recognition/Affiliation by the Statutory Bodies. g) Qualifying marks in AP ICET-2019 is 25% and no minimum marks are prescribed for SC/ST candidates. 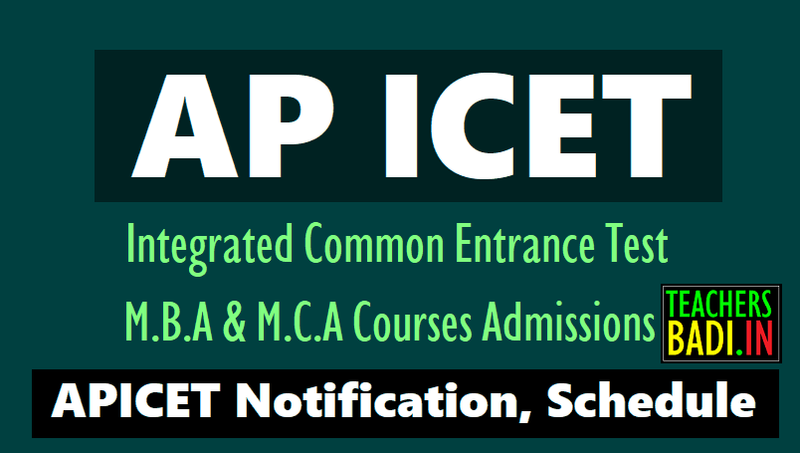 AP ICET 2019 Applications should be submitted through ONLINE mode only. The Registration fee for online submission and late fee, if applicable, may be paid at AP Online Centers / Mee Seva Centers, e -Seva Centers in A.P. and also through payment gateway (Credit Card/Debit Card).